Man Up Time's endless-runner falls short of expectations. We've been spoiled for choice in the endless-runner category recently and it's fast becoming the new saturation genre. Robot Unicorn Attack was an over-the-top riot of silliness, while Tiny Wings charmed and soothed us on our way to work in the mornings. More recently, the phenomenally successful Jetpack Joyride saved us all from permanently falling-out with our families at Christmas. 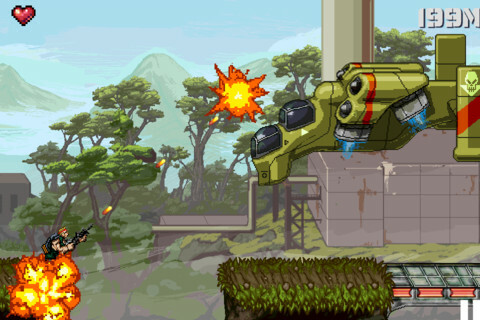 Gun Runner is the next game to step up for an infinite roam and features a special forces soldier blasting through an alien-ridden South American jungle in order to save his brother. 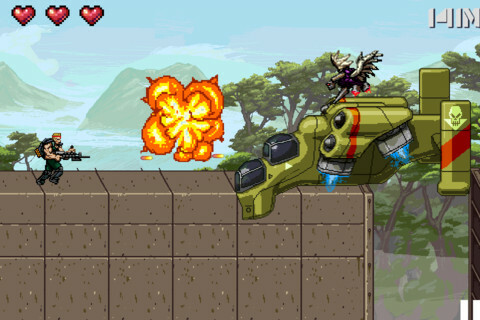 As with Robot Unicorn Attack, it's a two-jump affair that requires you to judge leaping distances while collecting the currency that litters the environment. Your soldier fires automatically at the ships and enemies that spawn ahead, and once a run is over the cash is totted up and used to buy weapon upgrades. 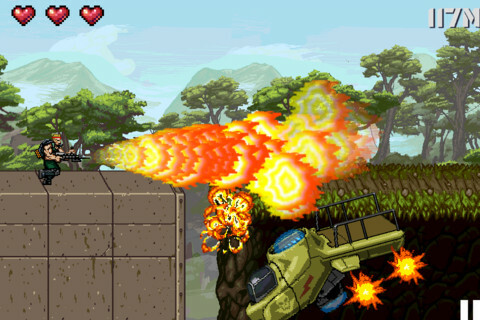 Weapons fire automatically as you rumble in the jungle. Sadly this currency is often sparsely populated within each attempt, and while the best free-running games truly do give you a new experience every time you play, the devil's always in the detail of those finely-tuned algorithms that generate a random, but critically rewarding environment. It's a delicate balancing-act that Gun Runner struggles with in both currency and enemy spawning. The pacing of the game is also tuned to be far too slow and it's tough to muster up the motivation to burn through the slow start that precedes the zippier action. More problematically, a glitchy camera often causes enemies to become obscured beneath the character and out of view entirely. As a result, when death comes it's very often in the form of a plunge into an invisible, game-ending pit that you have no means of judging. Frustrating. Ships spawn an endless stream of monsters into your line of fire. On one particular attempt, and after running for over a thousand meters in the game doing nothing except jump between the same two textured ledges, I leapt into the unknown to cash-in the money that I'd earned on that run. Only as I fell did I see the assault ship hovering much further down the screen, spitting enemies into the air. It seems that environmental progression is tied in closely with the destruction of these drop-ships, but with no way of engaging the enemy I could only take a leap into the dark, one which ultimately ended my game. Things do improve once you unlock the first weapon upgrade, and it becomes far easier to destroy these vehicles, meaning it's less likely that you'll become locked into these landscape loops. It's a slog to get there though, and while there are some fun weapon upgrades to be earned such as the 'Ripley' (a flame-thrower combined with a machine gun), the game currency costs are high and it takes far too long for the game to reach an enjoyably challenging pace. In-game app purchases are another option for progression, but are very steep. Weapon upgrades are cool, but either too time-consuming to unlock or just too expensive. There's a neat idea about Gun Runner, and in style it pays a fair homage to its inspiration Contra. Further updates may also fix some of the more practical issues with the game, but unless the environmental progression and reward systems are also drastically tweaked it's a very tough game to recommend, even with the free cost of entry. What's Hot: A fun setting with some lovely art. What's Not: Poor landscape generation, issues with camera and enemy placement, takes far too long to reach a satisfying pace.